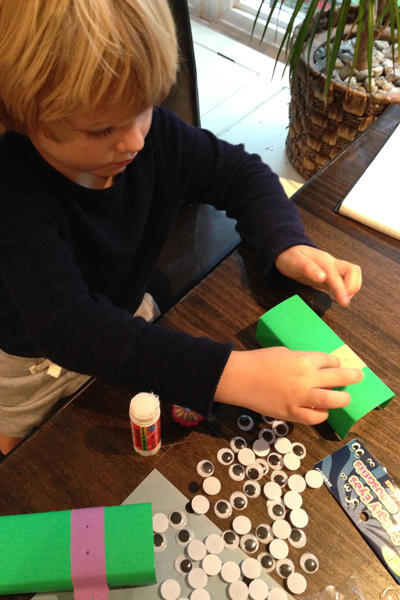 My favourite DIY moment of the year remains my kid’s Bday. He gets so excited about our themes that it is well worth it. 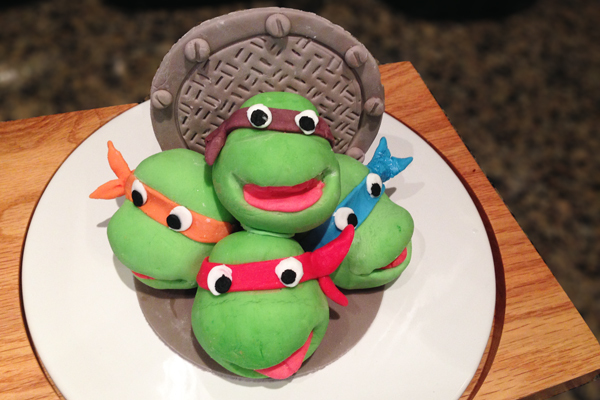 For #4: Ninja Turtles. It’s a great theme to work with as the turtle face lends itself to so many applications and the color scheme is easy and festive (green, blue, purple, red, orange). The inspiration came with a Walmart paper mask find. 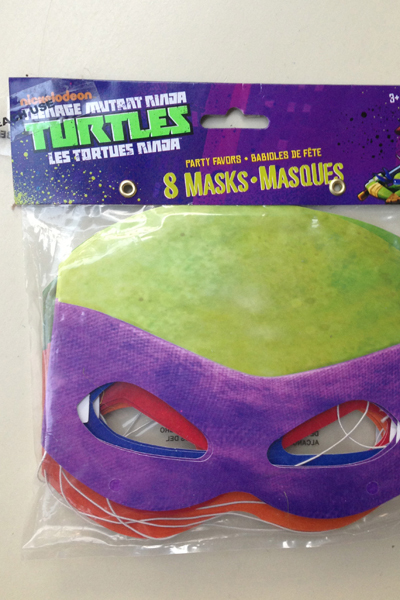 Would it not be great to turn these masks into invitations? I designed a sticker invitation (Photoshop and Illustrator) and printed a few sheets on Vista for a couple of dollars. Finished stickers were placed on the backside of the mask. 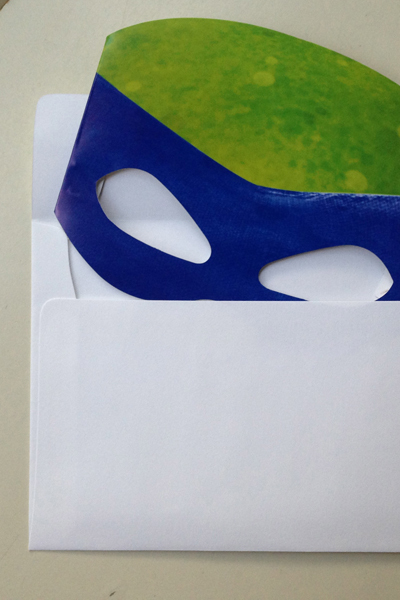 Masks inserted into envelopes and voila! Big hit with the little guys (and gals). The complete invites cost me under 70 cents per piece (for 16). 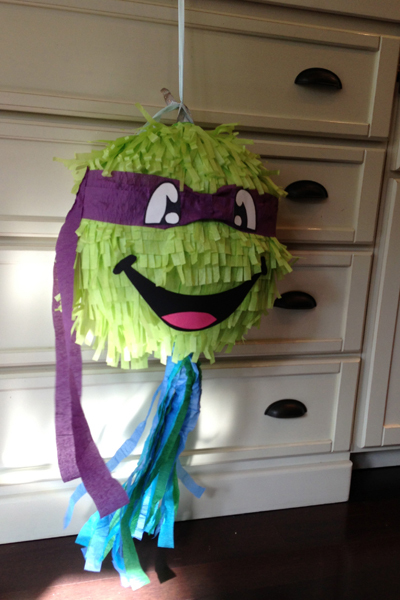 My son was very, very clear that he wanted a pinata and he wanted me to make it. A little research got us started. This is so much fun to do together with your birthday boy or girl. I used a foil circle balloon as the base. 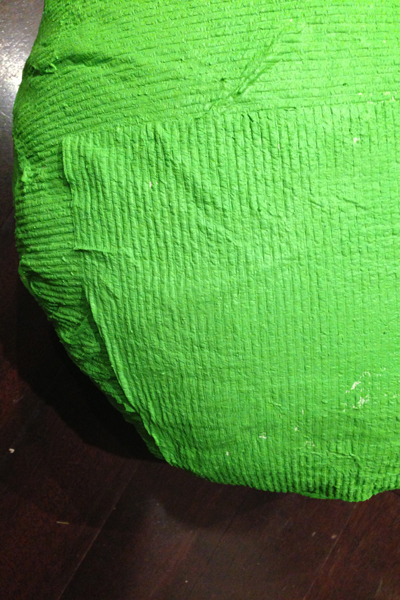 Paper mache glue is super simple to make mixing water and all-pupose flour (1:1). There really is no need to buy expensive glue. The flower and water works like a charm. 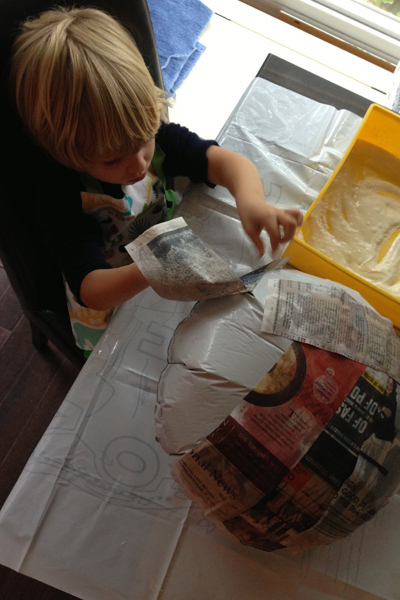 Cut 2-3 inch strips of newspaper and cover the balloon (about 3 layers. Any less and the pinata will break on the first swing. Any more and you might be hitting it all day…). Have your child help with this part. It’s a fun icky job with your hands covered in your home-made glue. Let dry. This will take a good 24 hours. You will know when it is dry. 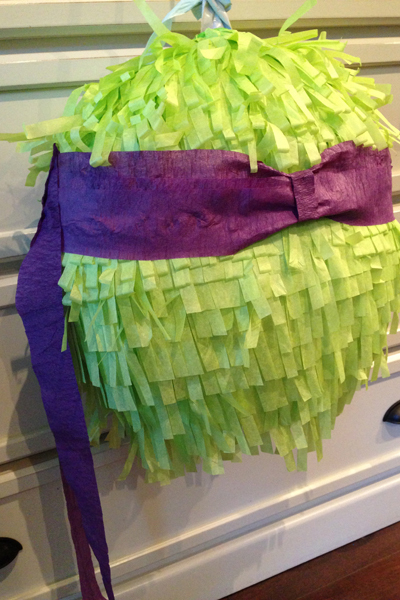 I painted my pinata even though I was planning to cover it with fringed paper because it prevents any white shining through the flimsy fringed paper. 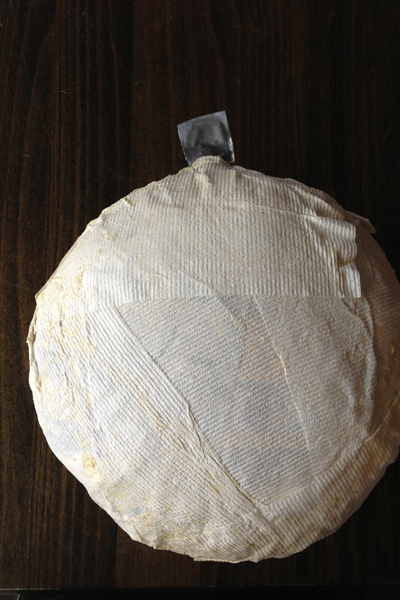 Let dry again and then apply fringed paper using regular white craft glue until the whole baloon is covered. I used a strip of paper to create the mask. For the eyes and mouth I used paper and a marker and glued them on top. 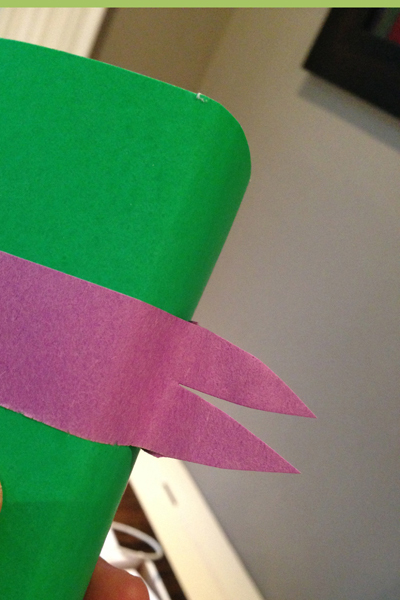 A few extra strips of paper on the bottom for festive movement and voila. Ready to be whacked! I am obsessed with juicebox transformations. Its always so simple and fun. 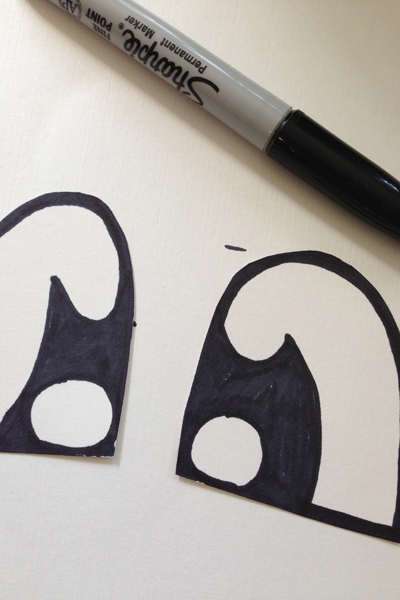 Just cover juiceboxes in craft paper, cut out little masks and wrap around juiceboxes, letting the ends stick out to make it look very real and some googly eyes finish the craft. 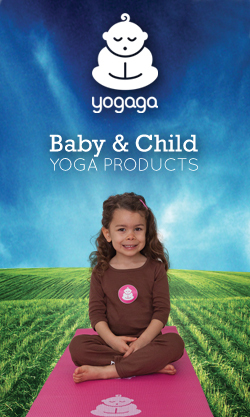 Another great one to have your child help out with. I found the design of this cake topper online and simply copied it (my first ever fondant creation. Nailed it!). I had two parties on my sons birthday. The kids party followed by the family party. 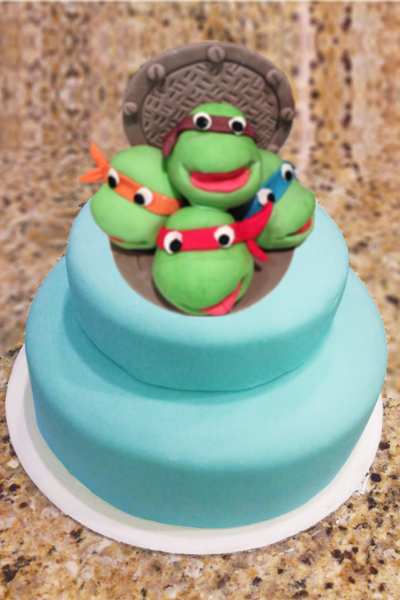 For the kids’ party I bought a store-made slab of cake (Costco) and simply added the cake topper. Then after the kids party, I transferred the topper to the family party fondant cake. 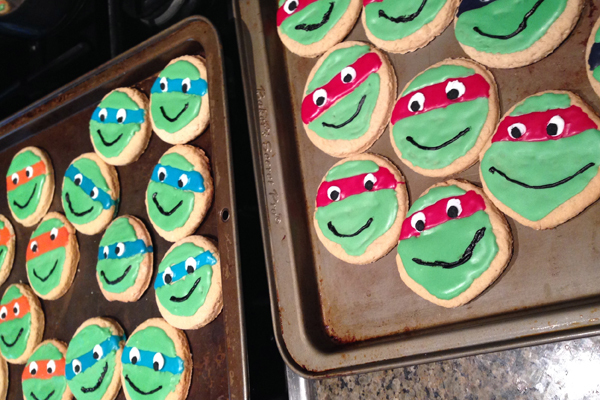 It’s so easy to turn a round cookie into a ninja turtle cookie so we really wanted to make them both for the party and to add to the goodie bag. We used a simple sugar cookie recipe and went to town with our icing. 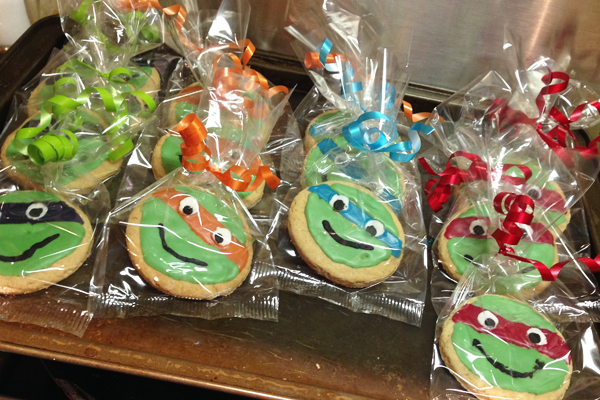 We packed the goodie bag cookies in little plastic cookie bags and added some string in coordinating colors. For those who have been following my previous DIY creations, you know I have a thing for using foam mannequin heads. 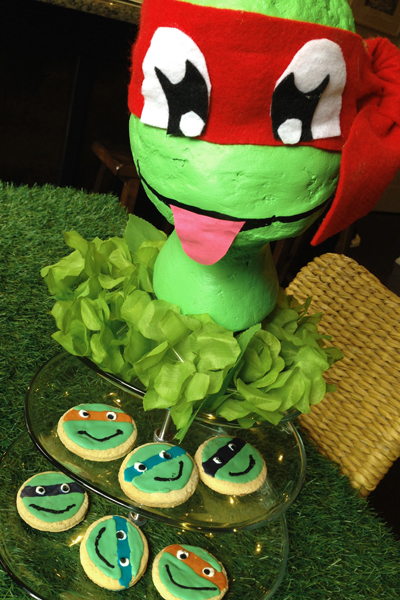 I used one of last years SuperHero heads (click image below if you are interested) and turned it into a funny Ninja Turtle using a knife (to reshape the head), some acrylic paint ,and felt plus a black marker for eyes, mouth and tongue. 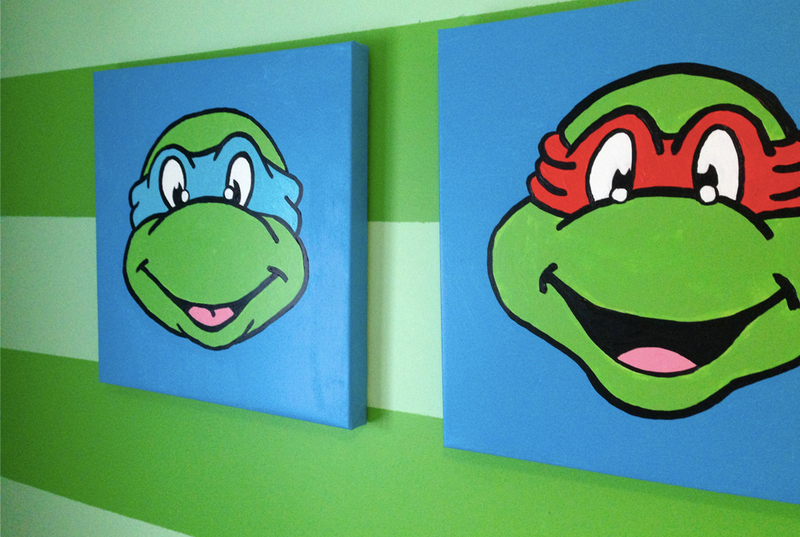 Pin the pizza on the Ninja Turtle (I used the acrylic painting I had made for my son’s bedroom – see my other post Big Boy Room Ninja Turtle Artwork and found a pizza slice image online which I printed on cardstock). 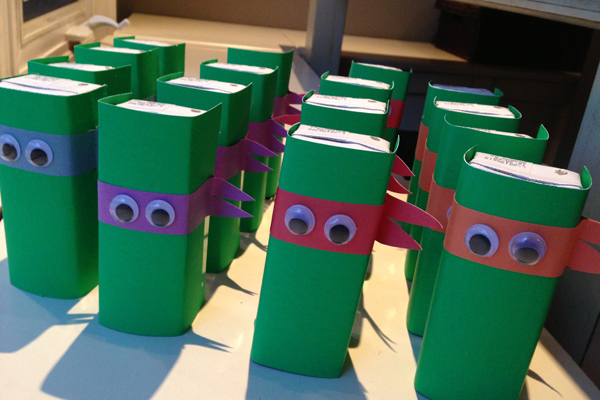 Ninja Turtle Musical Chairs: I simply bought some of the more fun Ninja Turtle songs from the movies to create a custom playlist for our musical chairs game. Ninja Turtle Obstacle Course: I held the party in the community gym so had access to pylons and hula hoops and made a simple obstacle course and put two teams against each other. From: Kid's Birthday, Party Time!